The State of DRaaS...A Few Thoughts - VIRTUALIZATION IS LIFE! 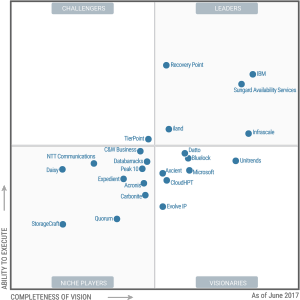 Over the past week Garter released the 2018 edition of the Magic Quadrant for DR as a Service. The first thing that I noticed was how sparse the quadrant was when comparing it to the 2017 quadrant. Though many hold it in high regard, the Gartner Quadrant isn’t the be all and end all source of information pertaining to those offering DRaaS and succeeding. But It got me thinking as to the state of the current DRaaS market. Just before I talk about that, what does it mean to see less vendors in the Magic Quadrant this year? Probably not much apart from the fact the ones that dropped out probably don’t see value in undertaking the process. Though, as mentioned in this post it could also be due to the criteria changing. As a comparison, from the past three years you can see above that only ten participants remain down from twenty three the previous year. There has been a shift in position and it’s great to see iLand leading the way beating out global powerhouses like IBM and Microsoft. But does the lack of participants in this year’s quadrant point to a declining market? Are companies skipping DRaaS for traditional workloads and looking to build availability and resilience into the application layer? Has network extension become so common place and reliable that companies are becoming less inclined to use DRaaS providers and just rely on inbuilt replication and mobility? There is an argument to be had that the push to cloud native applications, the use of public cloud and evolving network technologies has the potential to kill DRaaS…but not yet…and not any time soon! Hybrid cloud and multi-platform services are here to stay…and while the use of the hyper-scale public clouds, serverless and containerisation has increased, there is still an absolute play to be had in the business of ensuring availability for “traditional” workloads. Those workloads that sit on-premises, in private or public cloud platforms still use the base unit of measurement as the VM. This is where DRaaS still has the long game. Depending on region, there is still a smattering of physical servers running workloads (some regions like Asia are 5-10 years behind the rest of the world in Virtualisation…let alone containerization or public cloud). It’s true that most Service Providers who have been successful with Infrastructure as a Service have spent the last few years developing their Backup, Replication and Disaster Recovery as a service offerings. Underpinning these service offerings are vendors like Veeam, Zerto, VMware and other availability vendors that offer software that Service Providers can leverage to offer DR services both from on-premises locations to their cloud platforms, or between their cloud platforms. Traditional backup vendors offer replication features that can also be used for DR. There is also the likes of Azure that offers DRaaS using technologies like Azure Site Recovery that looks to offer an end to end service. DRaaS still predominantly focuses on the availability of Virtual Machines and the services and applications they run. The end goal is to have critical line of business applications identified, replicated and then made available in the case of a disaster. The definition of a disaster varies depending on who you speak to and the industry loves to use geo-scale impact events when talking about disasters…but reality is that the failure of a single instance or application is much more likely than whole system failures. It’s an immutable truth that outages will occur! I’ve written before about this topic before and even had a shirt for sale at once stage stating that Outages are like assholes…everyone has one! There are those that might challenge my thoughts on the subject, however as I talk to service providers around the world, the one thing they all believe in is that DRaaS is worth investing in and will generate significant revenue streams. I would argue that the DRaaS hasn’t even hit an inflection point yet, whereby it’s been seen to be a critically necessary service to consume for businesses. It’s true to say that Backup as a Service has nearly become a commodity…but DRaaS has serious runway.